Filled in and painted over the zillion holes I've made in the walls, as a result of indecisive and impromptu wall decor accessorizing. Dear 3M, send me some of your magic picture hanging adhesives...pretty please? Looking over that list is making me tired! There is always more to do around here...I don't think I'll ever win that championship, but I am glad for what I did get done this week. 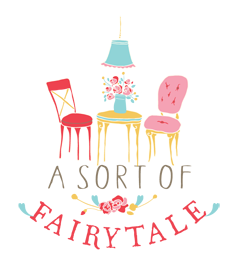 I'm hoping to mostly just relax and enjoy the weekend, and squeeze in a visit to one of my fave vintage shops, Tattered Tiques, for their monthly shop event. Wishing you a relaxed and fun weekend as well! oh YAY I am glad to hear that you are feeling much better and off with a bang. I have been feeling pretty ugh lately and seeing your fun pieces is giving me energy to get movin! you've been busy, my friend. love the new arrangement, it's lovely. and that new side table? absolute perfection in your living room. Ooooh all of that looks so cute! Thanks for sharing! New post at Cupcakes and Candy Canes! The shelf and hutch look wonderful all dressed up, I've got the baking bug this week too! The art work looks great, lovely idea! Pretty. I love the details in your kitchen. You've been one busy girl! And that is with a little one in tow! Wish I could find a deal like that on a hutch. the framed book pages are incredible! WOW! You have been busy. You cabinet looks GREAT. The window is a great idea with the children's book pages. I to have used window's as picture frames. They where knocking down my great grandmother's house. So I got some wonderful window's out of it. Wow, Stacey, you have gotten so much accomplished! 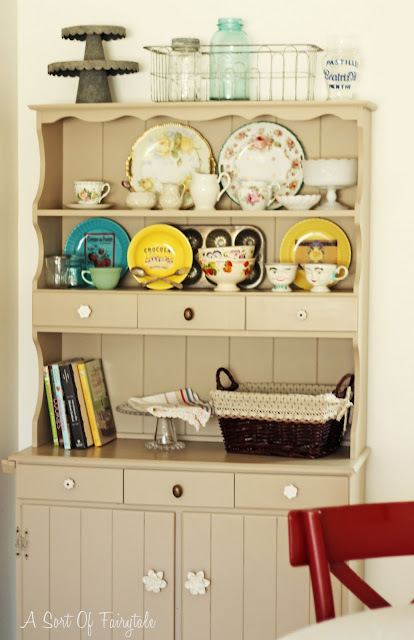 I love your hutch and your little blue table is very sweet. 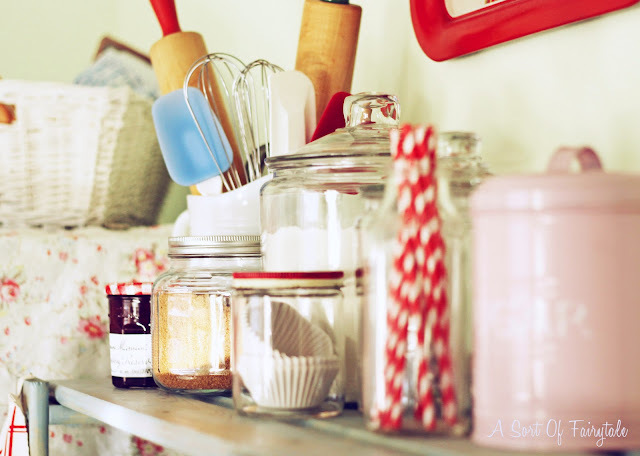 I'm also eyeing your pink Sugar canister ~ I've had my eye out for something like that lately ~ very pretty!! You have been one busy gal!!! :) We must think alike, because I saw that samr window frame picture thingy at Pier 1 too and was "this close" to getting it! lol LOVE everything and I can't wait til you "reveal" your bag!!! Woohoo - go you!!! your home seriously makes me so happy- it's such a cheerful place! oh Stacey! you should be patting yourself on the back!!!! how wonderful everything looks!!!! 3 CHEERS FOR YOU!!!!!!!!!!!!!!!!!!!!!!!! Everything is soooo cute! You did a great job and got a lot done! Whew, I'm worn out just reading about all the things you accomplished! Everything looks fabulous! I love the cheery kitchen rack and the window art. Nice job on all of it! Now you need to relax. you have gotten a lot done. i am tired just reading it. your home looks adorable. i know i say that a lot but it's so true. yu've been VERY busy!!! love the vintage book pages in the window frame. sweet! 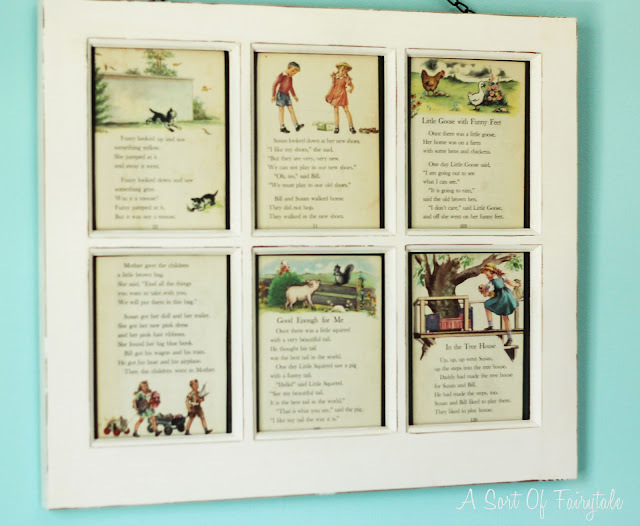 I LOVE that vintage book page/window frame art. So fun!! Sounds like you were productive. I can't wait to see your purse on Monday!! Whew, I'm tired just reading about all you've accomplished this week! But it all looks great and I'm so excited you finished the purse! Love your new Martha table--what a gorgeous shade of blue and the curves are so pretty. You have been a busy bee! I am looking forward to seeing your reveal! Now, I must keep going on my "Imagine the Impossibilities" projects! 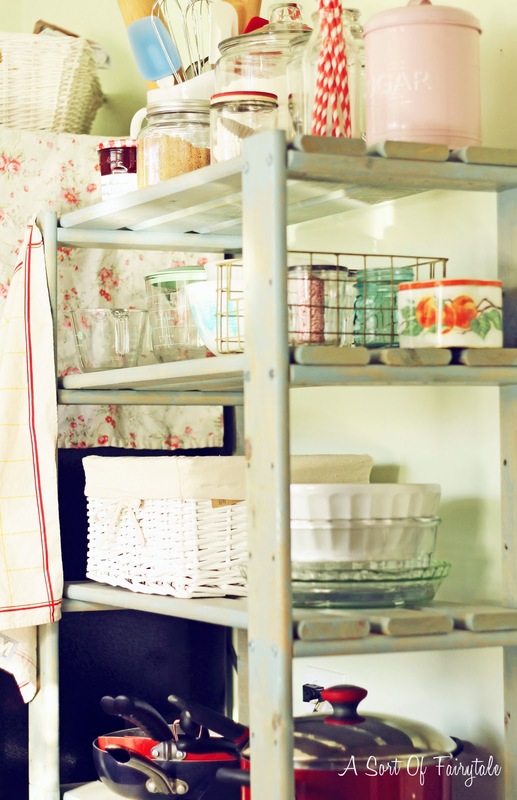 I love the baking rack! 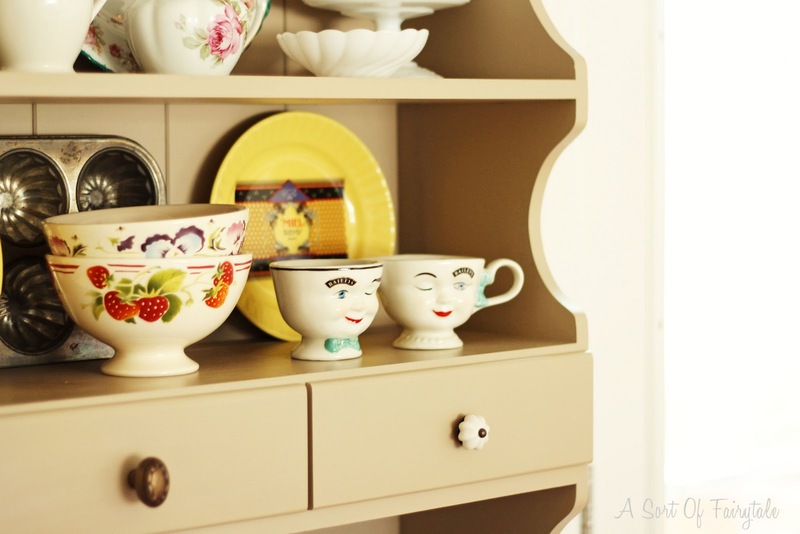 How cute..this is inspiring me to make one..when I get a bigger place! Thanks for sharing, I'm bookmarking this for the future. I found you on my Mom's blog over at Town and Country Living! Can't wait to check out the rest of your blog! I'm your newest follower, I'd love it if you followed me back! Your baker's rack is lovely, nice and fresh! 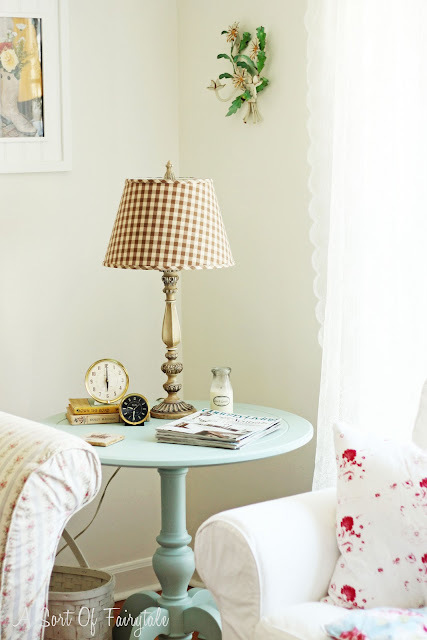 Love the Martha S. table...thought is was a vintage that you painted! Love it. New follower. Shew....now doesn't that feel better?! Im new to your blog and I LOVE IT!